The Dri-Eaz Evolution LGR dehumidifier is the only low grain refrigerant dehumidifier that is designed specifically for the trained professional. Dri-Eaz combined the best drying technology with the most functional, user friendly features. 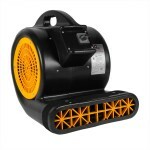 We recommend using one of our carpet drying fans or one of our axial flood fans for increased movement of air, and quicker drying. A low grain refrigerant (LGR) commercial dehumidifier operates on the principle of dew point. Moisture-laden air is drawn across super-cooled coils. When the temperature of the air drops below the dew point, the water vapor condenses out of the air onto the cold coils. The air, now drier is reheated and exhausted to the room to collect more moisture. This Dri-Eaz LGR Evolution dehumidifier pulls an industry low of 5 amps, which means you can plug up to 3 dehumidifiers into the same 15 amp electrical circuit, and not have to worry about blowing the breaker. An intelligent pump cycles every 6 minutes to reduce the chance of leaks or spills. The 40' quick disconnect drain hose allows you to drain the recovered water into any floor drain, toilet, or sink. Low grain refrigerant system removes up to 18 gallons a day of liquid, under optimum conditions. Compact, portable unit weighs only 92 pounds for easy one person transport. Draws only 5 amps, so multiple units can be plugged into the same circuit. Built -in ring for easy attachment of any type of ducting. The High Airflow Filter (HAF) captures more particles than a traditional foam filter. UL & C-UL listed to meet standard safety regulations. 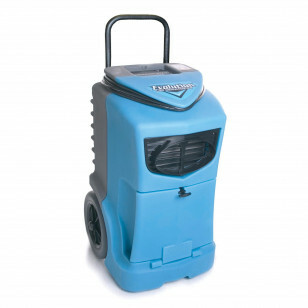 This is a review for the Dri-Eaz® Evolution® LGR Dehumidifier - Low Grain Refrigerant.